The judge in the case said she believed the prisoners account of what had happened, irrespective of his criminal record and the fact he was in prison. 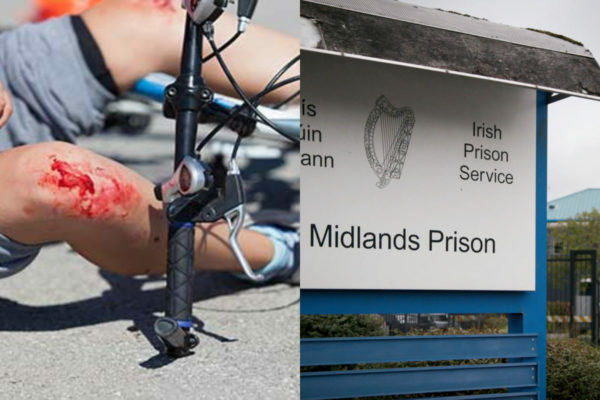 A man currently serving a prison sentence has been awarded €20,000 after he was knocked off his bike cycling home from a fishing trip. The motorist who hit the victim did not stop and was never traced. However, cyclist Thomas O’Neill sued the Motor Insurers Bureau of Ireland. The victim, a 47-year-old with 20 previous convictions, is currently serving a six-year jail term, the High Court was told. That sentence, for a breaking into a house in Cork with a yard brush, was imposed on him last May when O’Neill’s address was Ringfort Ave, Balrothery, north Co Dublin. However, the crash from his bicycle occurred back in June, 2014, at Ballyheary Road, Swords, Co Dublin. O’Neill was cycling home from a fishing trip at the time and he claimed in his action the driver was not paying attention, did not swerve to avoid him and then left the scene. The court was told O’Neill was knocked out due to the impact and had suffered swelling to his jaw, while also injuring his arm and back. He also claimed the manner in which he could open his mouth was left restricted by his crash injuries. Mr Justice Hanna awarded him €20,000, saying while O’Neill was a criminal and had had a drug addiction, she believed he was telling the truth about the crash. She added the fact the victim was serving a prison sentence at present did not disbar him from taking his case. O’Neill’s account, the judge said, had also been supported by a taxi driver who came upon the scene and later gave evidence. Another witness who had taken photographs of the bike made them available and they showed damage to the bike consistent with O’Neill’s account.